This is a list of the hospitals who are currently using the Beads of Courage programme with details of who has sponsored each hospital. We are extremely grateful to all our sponsors without whom, we would not be able to provide this programme. If your child is being treated at one of these hospitals please enquire about the Beads of Courage programme on your next visit. 5. City General Hospital, Staffordshire Sponsored by 1) In honour of Olivia Perry. Funds donated by Olivia’s family and friends collected at the celebration of her life. 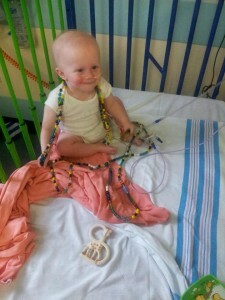 Olivia loved her beads and was enrolled on the programme at City Hospital. She continued receiving her beads at Alder Hey. Thank you! 11. The Royal Marsden Sponsored by 1) Hannah Howells and her amazing family!